Joe Blogs: Winning the war!!! I got soul but I'm not a soldier! In fact I'm not a soldier but I am once I switch on my Xbox 360!! Tonight my girl headed out with some friends leaving me and the Moo for a night of bonding. Clearly baby didn't check her messages though as she only had one plan for the night and that was to go to sleep. After cleaning up I decided that there was a war to fight and I was the man to win the battle. 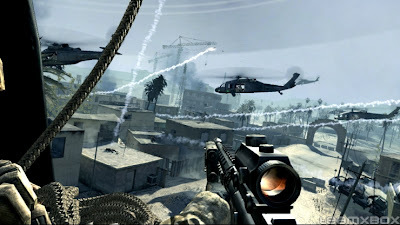 Been playing for a few hours now and Call of Duty 4 on veteran is tough! Glad that I am able to refer to a guide online and also YouTube for clips if I feel that I am making no progress. The wonders of the internet hey, and of course how quick I am to refer to help ha! In all honesty I wish I were out on the town having a few drinks but my time will come. For now though it's back to combat.... Medic!! !